Can an Amazon Echo Dot help Special Needs Moms Get Organized? Yes! I think using an Amazon Echo or Dot can help us special needs moms get organized. Our family just bought an Amazon Dot last week. I am already so hooked! It is already helping me remember things, and fewer important stuff is falling through the cracks of my busy life. Last Monday I went to my friend, Katie’s house to pick up some things she had for my grandson. Katie is raising her son, who has ONH, as a single mom. She showed me her Amazon Echo, and said it is not only fun, but helpful to her in a lot of ways as the mom of a child with special needs. It helps her stay organized, keeping track of all the little details of her life, and she also plays music for her son on the Echo. Her little boy is reluctant to talk, and having the Echo in their house has encouraged him to speak up, making requests of Alexa for things he wants to hear her say. The next day I started researching the Echo to see if it would help me enough to be worth the investment, that it really could help special needs moms get organized. I knew I wanted to use it for keeping track of my to do list and my calendar. We planned to sync it with our Amazon Fire TV for watching movies. I also thought our kids would enjoy listening to music (turns out I use this feature more than they do). We thought it would be a good investment, but this month my money is tight, so I decided to put off the purchase. Then, I discovered the Amazon Dot! It does everything the Echo does. The only difference is that the Echo has a better built-in speaker. That feature was not as important to me. I am more interested in Alexa’s practical uses than her entertainment value. 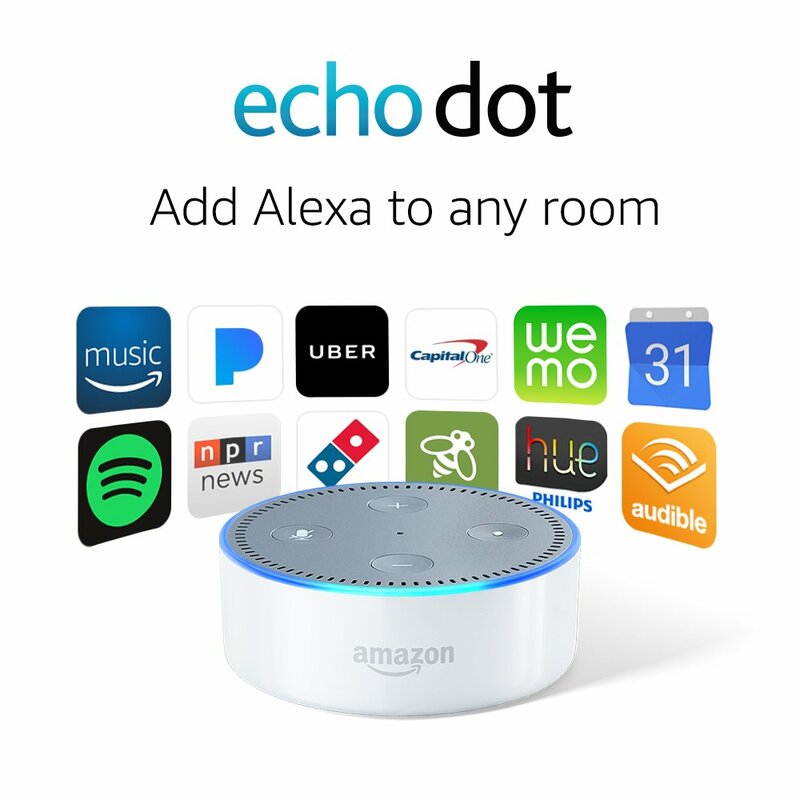 The Dot is about one-third the price of the Echo. I was sold, and immediately placed my order for the Amazon Dot! My Dot arrived five days ago. I spent a few hours this weekend learning how to use her and downloading some of the apps I want to use with her. I say her, because the device uses a female voice that goes by the name, Alexa. If you already have an Alexa in your family, you can switch her name to Amazon. Keeping track of my to-do list. I can tell Alexa to add something to my to-do list, and she does it. I can then access the list on my phone through the Alexa App. Keeping track of my shopping list. She will add items to my shopping list, which I can access on my phone when I am at the store. Keeping track of my calendar. I just ask Alexa to add an event and she will record it on my calendar. I can ask her for events coming up, or ask her to remind me what events I have on any given day. Weather report. While getting the kids ready for school, I can ask Alexa for the weather report. I don’t have to pause in my routine to look it up online, or wait for it to be announced on the tv or radio. I can get it exactly when I need it, and be sure that I am sending them off dressed appropriately for the day. Leave messages for family members. I can leave messages for them with Alexa, and they can retrieve them when they get home. Throughout the weekend, I added items to my to-do list and my shopping list as I thought of them. On Monday, when I ran my errands, everything was right there on the Alexa app. I just referred to that as I went along. By the end I had everything crossed off both lists! I could tell Alexa as I remembered them, and didn’t have to hunt down my paper list. When I got ready to use the list, it was right there on my phone. So handy! Perfect for helping special needs moms get organized! The Amazon Dot helps special needs moms get organized. Do you think this would help special needs moms get organized too? I definitely do! Joy Ross is a blind mother who has a You Tube channel. In this video she demonstrated her Amazon Echo. Keep in mind that the Dot is just like the Echo, only smaller and cheaper. It can do all of the same things the Echo can do. This special needs mom is getting organized! One of my goals for this week is to connect my Dot with my Amazon Fire TV. I am hoping it will be possible for people in my family to use their voice to select a movie or show from the Fire TV. I also need to teach Alexa to understand my husband’s speech. He has both an accent and a speech impairment. This results in her not being able to understand him; however, I understand there is a system you can go through to teach Alexa to understand you if you have unusual speech patterns. After we do this exercise, I will report back. I realize this is important to anyone whose speech could be difficult to understand. Hopefully, this works well. When I need to repeat an order from Amazon, I can just ask Alexa to order it for me. For example, if I notice I am close to running out of diapers I can say, “Alexa, order Prevail Overnight Diapers.” She will then give me specifics about the order, including the price, and ask me if I want to order that. If that is the item I want, I will say yes and she will place the order for me. Amazon Dot helps special needs moms get organized. I tried to use Alexa to order a pizza from Domino’s last night. She didn’t know what to do. There is a way to do this, so I need to fix this. I think I probably need to link her to my Domino’s account. Alexa will read Audible books to you, but I don’t have an Audible account. I understand she will also read books from your Kindle account, which I do have. I haven’t figured out how to get her to do this yet. So, that is another thing I need to set up. Do you ever put things away and then forget where they are? Alexa will tell you where you put stuff! Just tell her when you put it up, and if you later forget where you put it, just ask her where it is. Alexa can remind you when it is time to take medicine, administer a breathing treatment or do other tasks. She can remind you to do almost anything! It sounds kind of like Alexa isn’t streamlining my life as much as she is giving me more to do. But, I assure you, this is not the case. I am already benefiting from Alexa’s productivity skills. In addition to the ones I have already been using, the Dot can set timers and alarms. If you have AT&T, she can send text messages for you. She can track a UPS package or tell you the nearest UPS location. New apps are being created all the time that enable Alexa to have new skills. I foresee this device becoming increasingly useful over time. My husband and I plan to get another Amazon Dot for our daughter, who is blind. She will use hers differently than I use mine, but it will be as much of value to her as mine is to me. As a young blind woman, I think she will really appreciate the hands-free features of this device. Let’s help special needs moms get organized! Do you have an Amazon Dot or Echo? Has it helped you get organized? Do you plan to get one? How do you think you would use it? Next Post:What Will Happen to My Special Needs Children When I Get Old? When I’m fixing dinner, I can tell Alexa to set a timer for 20 minutes. Then it reminds me with a tone, and I remove the food from the oven. I use the timer for work situations too. I can set it and work until the timer sounds, then switch to whatever task I need to do next. I use it for an alarm clock as it is easy to tell her when you want to get up. Before, I couldn’t remember the steps for setting my regular alarm clock and would have to read the instructions. I haven’t used the timer very much. It’s great when cooking, and it could be handy for time outs, if you have little kids. Have you ever tried the relaxation exercises? It just takes a minute and will make you feel so good!